Esma, who chose to give her first name only, held a candle near the 50 symbolic prayer rugs representing the victims of the mosque killings in New Zealand at an interfaith vigil in Lexington. LEXINGTON — As the sun went down behind First Parish church Sunday, people of all faiths gathered on the historic Battle Green to remember the 50 people slain in the recent shooting massacre at two mosques in New Zealand. Women wore hijabs, the traditional Muslim head covering, and some Jewish men wore a yarmulke. Others held rosary beads, a symbol of Catholic worship. Nearby, prayer rugs for each person killed in the mass shooting at the mosques were placed on grass still brown from winter. Slowly, the names of each person killed on March 15 were read aloud, along with a short description of their lives and their loved ones left behind. Afterward, as the setting sun turned the sky pink, Imam Faisal Khan of the Islamic Center of Boston in Wayland sang the call to prayer. Muslim men took off their shoes and knelt for their evening prayer. It was a poignant moment during a candlelight vigil that drew hundreds in a show of solidarity with the victims in New Zealand and the local Muslim community. “I feel like it’s a good way to make sure that this is remembered and it doesn’t fall to the wayside,” said Devesh Pathak, 17, a junior at Lexington High School, and a founder of “Lexington Says #Enough,” a group for gun control. The organization formed last year after 17 students and staff were shot to death at Marjory Stoneman Douglas High School in Parkland, Fla. “Lexington Says #Enough” has since hosted half a dozen vigils for mass shooting victims, Pathak said. Sunday’s gathering marked the first time the group has collaborated with the Lexington Interfaith Clergy Association. The Reverend Anne Mason, minister of First Parish church, said the anti-gun movement shares a “beautiful intersectional unity” with the clergy association’s commitment to peace. “It has been an excruciatingly painful year with the number of mass shootings that have been happening,” said Mason, whose towering white church overlooks Battle Green. During the hour-long vigil, faith leaders offered prayers for the victims and for a world free from gun violence. 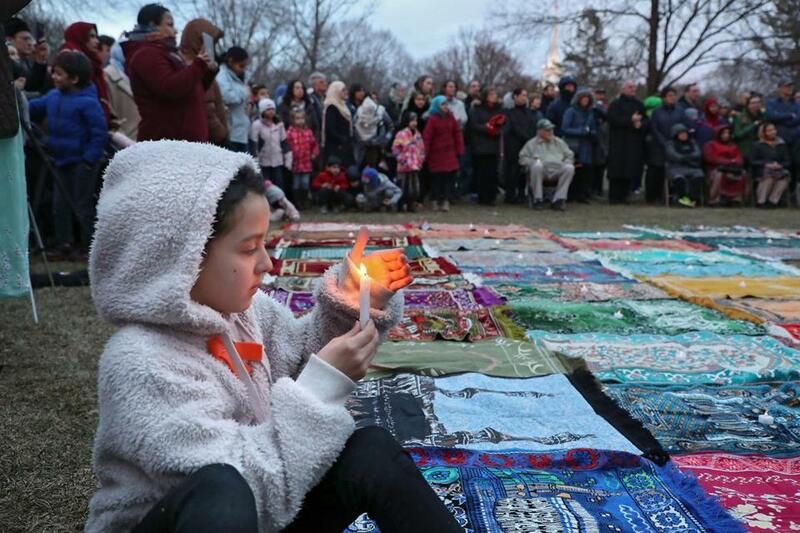 The vigil marked the first time Muslim prayers were offered on Battle Green, where some of the first shots of the American Revolution were fired on April 19, 1775. “In my view, this is very historic,” said Tahir Chaudhry, a former president of the Islamic Society of Boston/Wayland, who is also a member of the clergy association. Chaudhry is hoping the vigil creates a sense of urgency to combat gun violence. The Muslim population in Lexington is small, only about 150 families, and the town has no mosque. 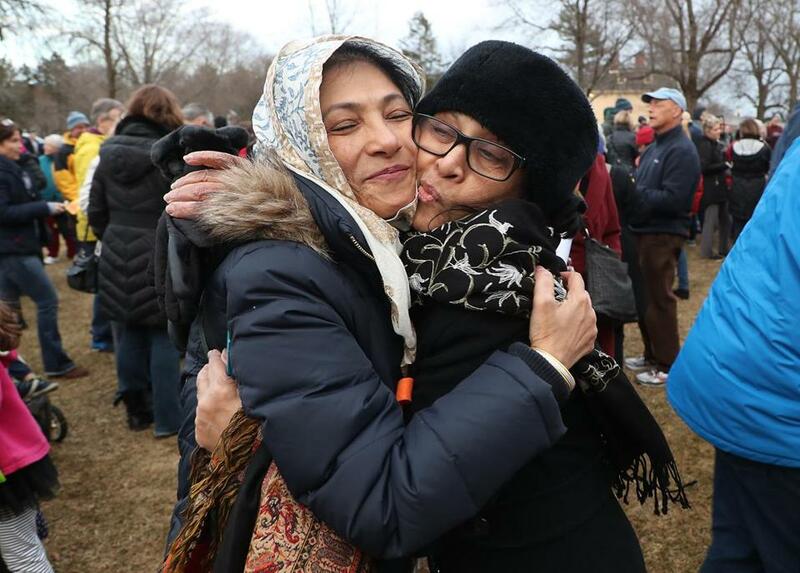 Without their own house of worship, local Muslims often do not know how to express themselves to the community, said Amber Iqbal, an organizer of the vigil. The outreach from local Christian, Jewish, and other faith traditions can help educate people about their faith, she said. “I like these kind of interfaith dialogues,” Iqbal said. After the vigil was over, Mason invited attendees to First Church for “Chai, Samosas, and Conversations,” and to continue talking. Lisa Boehm, a member of Lexington Says #Enough, complimented him on the quiet beauty of his voice. “The Quran is written in a way that is meant to be sung out loud,” he explained. 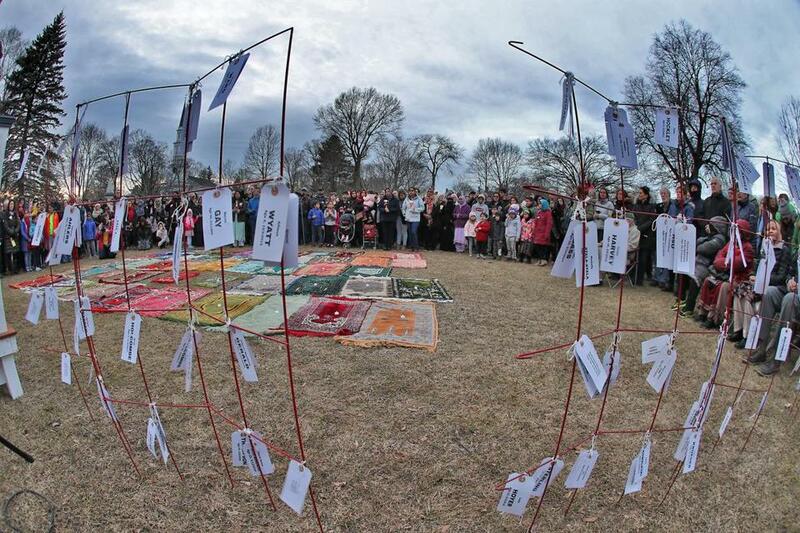 Tags and prayer rugs were used as symbols to honor the victims of the Christchurch, New Zealand, shooting.